Doris is the wife of Antonio Bartoccetti (Antonius Rex and Jacula) and the mother of Anthony Bartoccetti,best known as Rexanthony. 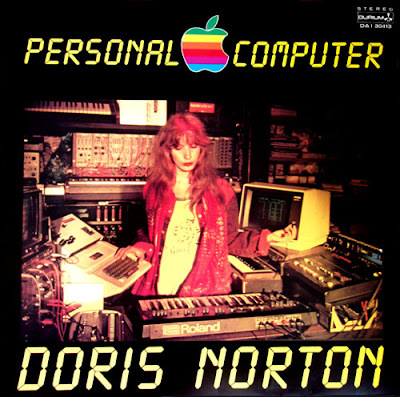 During the 80's she was sponsored by Apple Computer,and made a music program for IBM USA.She is the "voice" in Jacula and Antonius Rex LPs.Early experimenta/electro synth pop music all through.Her LP Artificial Intelligence coming later today!If anyone has her LPs Under Ground (1980). Parapsycho (1981). Raptus (1981)please contact me.I would appreciate a rip! Any chance you could post this one? was wondering if you have any of the Dramatics stuff (martha colburn/jasson willet). i only have the "garbage for your gut" triple set. keep up the good work! Nevermind, I found it at Curved Air! she looks cool, and sounds cool too!, thanks again for more killer lps! Fantastic. I can't believe I'm just getting around to listening to this one being the Apple freak I am. This is absolutely SICK!!!!!! Thanks Jim for hurting my head - again!! Thank you for posting this album. I just heard Jacula a few days ago and I'm mesmerized. I'm sure I'll love this as well.